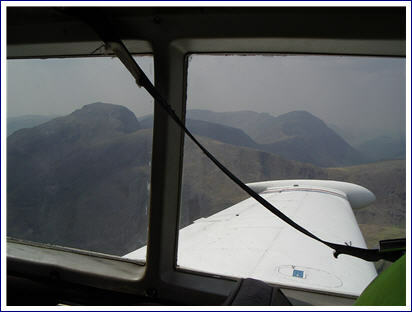 One of our climbing crew pilots a private plane (a 1966 Piper) from the beyond (that’s south of Lancaster) to the lakes, when the weather is suitable. Today I was invited to join him on a flight over the lake district. We left Walney airport around 2pm and followed the coast past Millom and Black Combe then turned North East. The weather although warm, was hazy and I was more than a little surprised and disconcerted when we hit an air pocket an jolted downwards briefly. We flew along Wast Water then swung due east and past Scafell and Scafell Pike, with Bowfell to our right. I attempted to take a few photos, but it was really hit and miss as to what the camera was pointing at when I pushed the button. Heading over the borrowdale valley towards Derwent Water and Keswick, we got word from Scottish air control that Walney airport would be closed for the next 30-40 mins. As that meant that we’d have to hang around somewhat, Keith, the pilot told me that we might as well head for Carlisle airport and grab a coffee. We had a little difficulty sighting the airport and had to take a turn before we followed a Puma helicapter in to land. Enjoyed a coffee and a plate of chips in the bar, then we set off to return to Walney. We passed Keswick and headed down between Derwentwater and Thirlmere en route to the Langdales. At this point Keith passed the controls to me and I was flying. How to describe it ? it’s a little like driving on ice, in that as the wind pushes you around you steer gently into it, coupled with the unreality of playing a video game, whilst being concious that you’re moving at about 160mph in a tiny vehicle. As we approached Gimmer Crag, I relinquished control and we flew down the valley, lining up with Coniston Water. Turning West again towards the Duddon Estuary and Black Combe, we were soon on the approach to Walney airport. It was interesting to experience the technique of landing, which pretty much comprises of a feel for the right angle and speed of approach, backed by training and experience. The tail of the aircraft was being constantly pushed sideways by a crosswind and we crabbed in at an angle of perhaps 15 degrees to the runway. As we approached touchdown Keith pointed the planes’ nose in line and we touched back down. What immediately struck me after landing was how forshortened time and distance had been up there. I’m tempted to say that it was an unreal experience, but that’s not a true reflection, rather like rock climbing it’s a concentrated focus that brings the senses alive. If you ever get the chance to fly in something other than a commercial airplane, say yes !